Great talk! Thanks for sharing it. So, what was the verdict on universal references and using (as an alternative to typedef), as discussed towards the end? 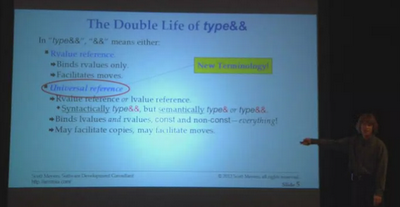 @Anders Sjögren: It seems that reference-collapsing does not occur in "using" typedefs. Section 8.3.2/6 of the standard (which is where reference-collapsing is specified) mentions only typedefs, template parameters, and decltype. auto is in the club, because its specification refers to the spec for template parameters.